#WeAreGies. This hashtag has been trending for months at the University of Illinois. Why you might ask? Last year, CEO of Madison Industries, Larry Gies, donated 150 million dollars to the school of business. Sparking the naming of the school to the Gies College of Business. And now the Gies College of Business is welcoming the class of 2022 to the campus! Just last Saturday, 250 prospect freshman for Fall 2018 came to Illinois to learn more about the college of business as a whole! And when they got there? 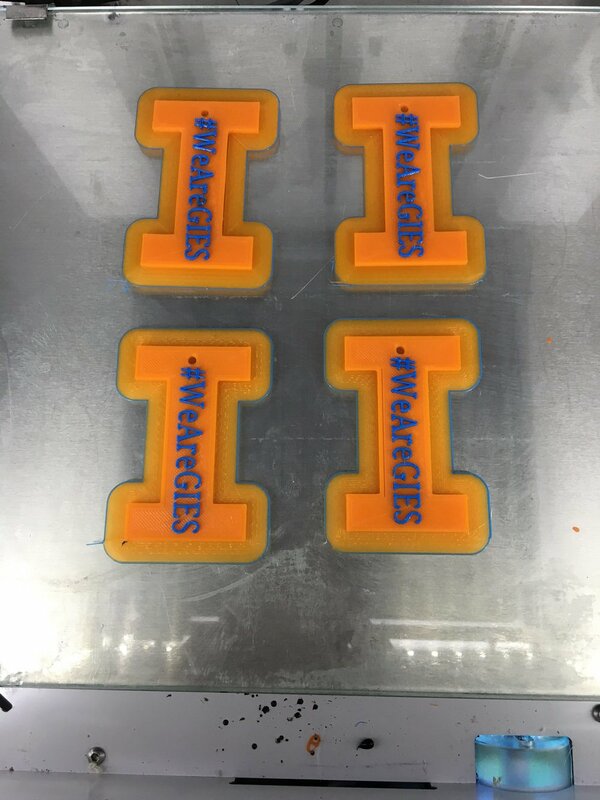 Each participant received a 3D printed keychain with #WeAreGies printed on it printed by yours truly, the Illinois MakerLab! Director of Undergraduate Admissions and Recruitment, Kelly Janssen, contacted us about 2 weeks before the event with a request to print 250 dual color keychains. We got off to a rough start struggling to get the keychains to print without curling on the edges but with the addition of a brim we were. 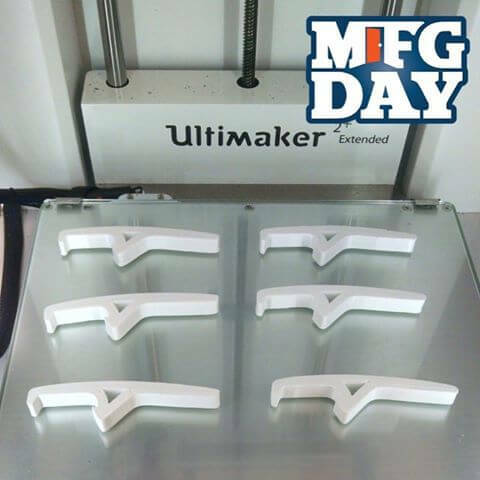 By utilizing all 3 of our Ultimaker 3's we were able to crank out this order in no time! We hope all prospect freshman enjoy their keychains! #WeAreGies! The University of Illinois is proud to be opening Carle Illinois College of Medicine. Olivia Coiado, a teaching assistant professor within the college, explains that this is the first college of medicine in the nation that is specifically designed to blend engineering and medicine together. This new college is looking at revolutionizing health by making students physician innovators. Students will learn how engineering and technology can be used to easily solve complex healthcare related problems.To showcase this new college they are hosting a series of open houses throughout the next year. 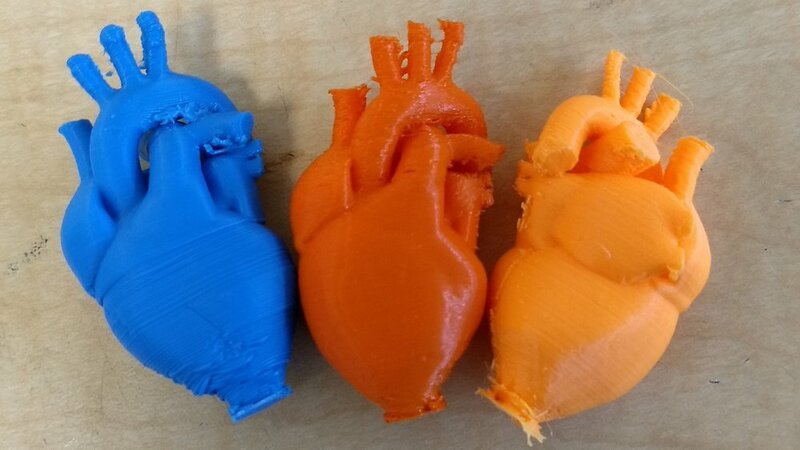 At each open house, participants will leave with a 3D printed heart printed by the MakerLab! We are printing 75 hearts a month for these different open houses and are even hosting some of them. 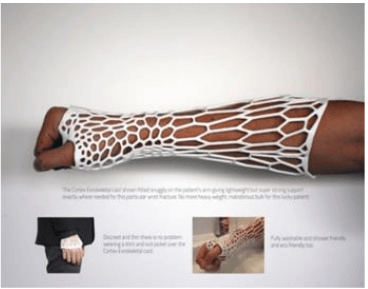 At our open house, we plan to explain how 3D printing can be used within the medical field. 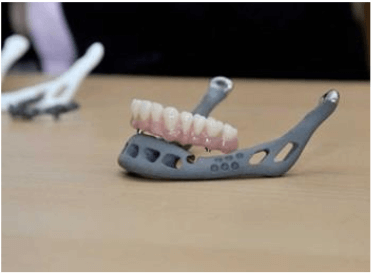 From 3D printed casts to teeth implants the possibilities are endless. We are very excited to partner with Carle College of Medicine to be able to explain how 3D printing and technology can blend with medicine to create new innovations and discoveries. Check out our other stories! Want to be featured in a blog post? If you have an interesting story that you would like to tell about making at the lab, share it with us! Don’t forget to like us on Facebook, or follow us on Twitter, Snapchat(uimakerlab) and Instagram! We were honored to participate in the Pygmalion Tech Demo hosted at Krannert Center a few weeks ago. As you can imagine, this demo involved hundreds of newly inspired ideas from prototypes to demo stages to upcoming new technology. Some projects include HTC VR glasses (virtual reality glasses), a new video game called Agents of Mayhem, the Makergirls, an electronic accordion and many more! Everyone was showcasing their products and most tables were running demos making it a very hands on event. The hope of the Pygmalion Demo was to make people more aware of the different forms of technology that they may not have known even existed. The MakerLab was there to promote creating your own ideas and printing them into reality. We had a 3D printer printing MakerLab keychains and a bunch of cool 3D printed parts to showcase to visitors! One of our gurus at the event, Linxi, was kind enough to share a story about a visitor that was interested in the MakerLab at the demo. She recalled that one such visitor was a junior here at Illinois majoring in accounting. He was at the demo trying to find more technologies that could be integrated into businesses. Technologies such as using 3D printing for prototyping. Prototyping can often be very costly and time consuming. But with 3D printing that same prototype companies can save a lot of money in the long run. 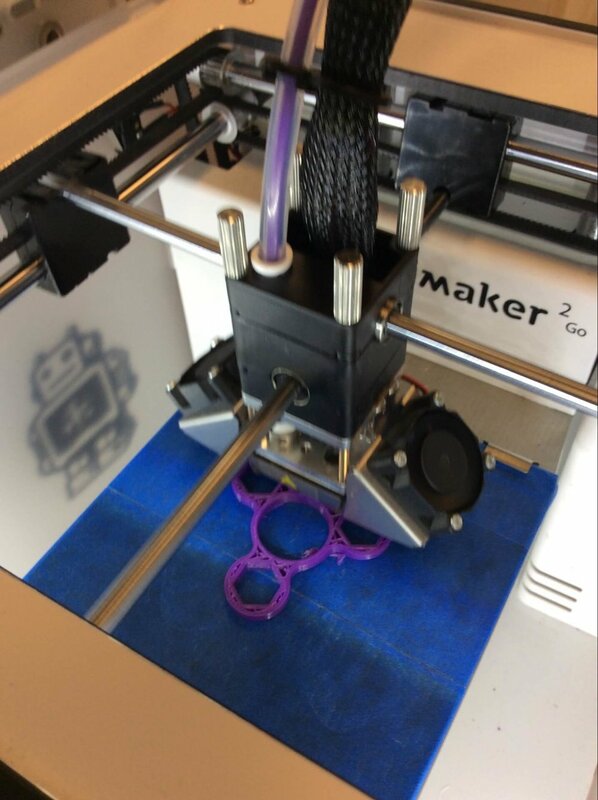 Stop by the Makerlab to see how 3D printing your prototype can save you money! The Illinois MakerLab is now open for business! Check out our hours and find a good time to stop in to explore what's new at the lab? We are excited to announce that we now have Snapchat Goggles at the lab! What are those you may ask? Imagine sunglasses that have a built in camera. That camera is automatically connected the the Illinois MakerLab's snapchat. When you take a picture/video with that built in camera it automatically uploads it to our snapchat! Stop by the MakerLab at anytime to come and try out our new goggles! We are now offering a workshops to 3D print your very own fidget spinner! This workshop can be used to replace the Basics 3D printing Workshop as you work towards your Digital Makers Certificate. Fidget spinner workshops are offered about twice a month of Fridays! We are now offering two new mini-camps along with our Minecraft camp! Our Build a 3D Printed Drone camp allows participants to code and create a 3D design of the drone they wish to print. Participates will learn OpenScan as the CAD Software to design the drone as well as how to assemble the correct electronics to make their drones work! Our second new mini-camp is 3D Printing a Talking BOT! This camp will allow participants to build their very own talking bot using a raspberry pi(a small computer)! Afterwards will 3D print its shell and make it talk to you! Both new mini-camps are for kids ages 13-17. Want to be a volunteer at the MakerLab? Apply to join the Fall 2017 MakerLab team! We would love to have you here! And don’t forget! Like us on Facebook, or follow us on Twitter and Instagram to get the latest news.